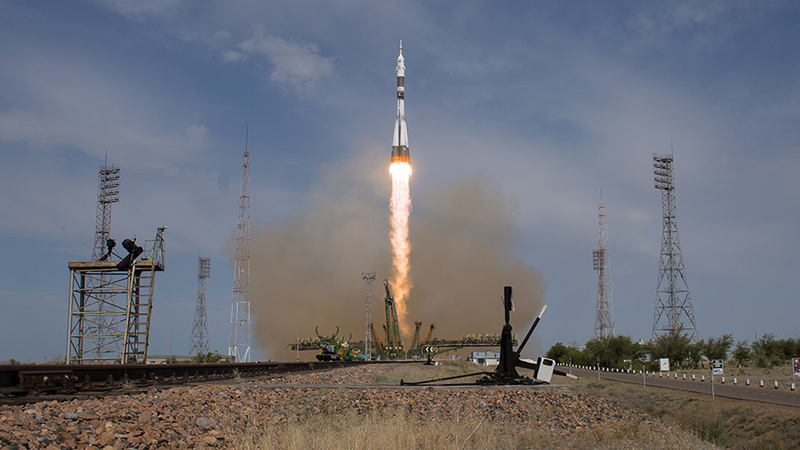 The Soyuz Ms-09 rocket blasts off June 6, 2018 with three new Expedition 56-57 crew members to the space station. Two astronauts and a cosmonaut are racing toward the International Space Station today inside the Soyuz MS-09 spacecraft. The new Expedition 56-57 trio comprising Sergey Prokopyev and Flight Engineers Serena Auñón-Chancellor and Alexander Gerst are due to arrive Friday at 9:07 a.m. EDT when they dock to the Rassvet module. NASA TV will begin its live coverage of the rendezvous and docking of the new crew at 8:15 a.m. NASA TV will then be back on the air at 10:30 a.m. when the new crew opens the hatches at 11:05 a.m. and enters their new home in space where they will live for the next six months. Waiting to greet their new crewmates are station Commander Drew Feustel and Flight Engineers Ricky Arnold and Oleg Artemyev who have been onboard the orbital laboratory since March. All six Expedition 56 crew members will gather in the Zvezda service module for a welcoming ceremony with family and mission officials back on Moscow. Next the crewmates will begin familiarizing themselves with station systems and safety procedures. In the meantime, Feustel and Arnold are moving ahead with preparations for next week’s spacewalk to outfit the station’s Harmony module with new enhanced high definition television cameras and wireless communications gear. The duo organized spacewalking tools and gear, recharged spacesuit and camera batteries and reviewed procedures for the 6.5-hour excursion planned for June 14. The new cameras will improve the view of approaching commercial crew vehicles for dockings in the future. The new wireless equipment will enable data transmission from payloads mounted on the outside of the Columbus and Kibo modules. Witnessing this on NASA TV what an extraordinary event. There has to be a big smile on John Glenn’s spirit. Congratulations to NASA and the other space agencies. Cooperation in space maybe the earth’s people can appreciate what is happening through various cultures and countries working on the ISS . Hallo. Guten Tag liebe ISS Besatzung. Ich stehe,wann auch immer ich euch am Himmel sehen kann,draußen und wünsche euch eine gute Reise,viel Erfolg und Gottes Segen. Habe meinen Mann schon angesteckt. Oftmals schauen wir gemeinsam dem imposanten Licht am Himmel hinterher. Bis ihr in den Wolken verschwindet. Wir grüßen euch von Herzen. Hans und Elizabeth aus Hannover.